While housing in Singapore is widely acknowledged to be one of the expensive in the world, a 2015 government study has also reported that home ownership in Singapore is 90.8%, making the country one of the top few places in the world where almost all residents own a place of their own. The types of housing available may appear confusing, especially if you’re hearing them for the first time from a property agent who won’t stop speaking in acronyms. If you’re confused about the difference between HDB, EC, and DBSS, read on to find out more. Housing in Singapore can generally be classified as public, private or semi-private. Public housing, created by the Housing and Development Board (HDB), was the government’s solution to the sprawling slums that dominated the landscape of 1960’s Singapore. Following the 1961 Bukit Ho Swee fire—one that left many homeless through the biggest outbreak of fire in Singapore to date—attitudes towards these government flats underwent a positive change. Even in 2015, a staggering 80.1% of the population in Singapore continues to live in HDB flats. Customer demand, however, began to impact the way that these public housing flats were constructed and run. Today, local buyers may choose between a typical Housing Development Board (HDB) flat, an Executive Condominium (EC) apartment, a bespoke apartment (DBSS), a studio apartment and many others. However, foreigners are typically restricted from purchasing public property in many instances, unless they fulfil certain criteria, such as having a Singapore Citizen in their family nucleus, with whom they are applying to purchase the apartment. HDB flats can generally be classified into 3, 4, or 5-room flats. A 2-room flat includes a living room, a bedroom, a kitchen, a bathroom and a storeroom. The two rooms therefore refer to a bedroom and a kitchen. A 5-room flat in that case, would include four bedrooms and a kitchen. In the 1970s, a slightly different form of public housing was built by the Housing and Urban Development Company (HUDC) for middleclass families who were able to pay a little more for larger flats, but whom were unable to purchase expensive private property. Today, most of these flats are privatised or undergoing privatisation. Many flats also possess balconies, which many residents use to hang their laundry out to dry or to store their aquarium tanks or birdcages. Public playgrounds, basketball courts, and badminton courts are commonly found in HDB neighbourhoods and shared by all the residents living in the vicinity. Sheltered walkways are becoming a common feature in most neighbourhoods, ensuring that residents will be protected from the rain as they return home from the nearest bus stop or the pick-up point. Car parks, single or multistorey, are also located close to apartments. Markets, provision stores, coffeeshops and salons tend to pop up in HDB neighbourhoods, and some are even located at void decks, thereby helping residents to shave precious minutes off their daily schedule. The Flexi Flat is the HDB’s latest accommodation option that combines aspects of previous studio apartment and 2-room flat accommodations. According to the Straits Times, 40% of these 2-room Flexi Flats are reserved for seniors. These compact flats are available in two sizes: 36 square metres, or 45 square metres. They are also able to be leased out for 99 years or for short-term periods, if the buyers are above the age of 55. The short lease Flexi Flat is an ideal choice for the elderly in particular as they would also be able to choose between three Optional Component Scheme packages that include items such as special flooring, sanitary fittings, and built-in wardrobes. Flats on short leases would also be fitted up front with grab bars to provide the elderly with greater convenience. Do note however, that sale or subletting of short lease Flexi Flats is strictly not allowed. A 99-year lease Flexi Flat may be resold or sublet, as long as the buyers meet the minimum occupation period of five years. An upgraded version of the HDB flat, DBSS flats offer a greater selection of choices when it comes to the designs and finishing of each apartment. In terms of pricing, these flats generally fall somewhere between a HDB flat and an EC. Unlike condominiums, DBSS flats do not offer onsite facilities such a swimming pool or gym. However, these flats are still highly sought after for their good locations and beautiful designs. DBSS flats are offered for sale under the same eligibility rules and restrictions that apply to new HDB flats. 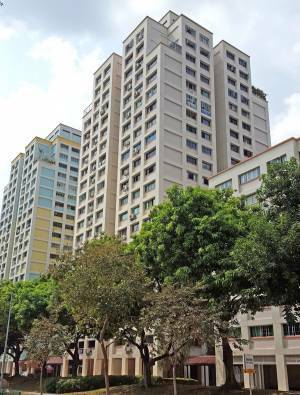 Like the DBSS flats, ECs are also designed and built by private developers, and thus stand apart from the usual HDB flats in terms of their design and finishing. Typical condominium facilities such as a fenced compound, a security guardhouse, a swimming pool and so on are also made available to the residents. Many EC purchasers are those who do not meet the income requirements in order to purchase a HDB flat. An EC can be purchased as long as the household income ceiling of the buyer falls below S$14,000. For those who are wondering why ECs sound so similar to private property, it’s because such accommodations (a form of subsidised public housing) actually does become private property after a period of ten years. This means that ECs in their 11th year or onwards, may actually be resold to foreigners and companies.